It’s one of the first articles Dave has ever sent that I actually decided to read. I have my ideas about the answer to that question (2 minutes or until they fall asleep, whichever comes first), but I was curious to hear from the experts. I already know Dave’s opinion on the subject: talk about soccer as much as possible to as many people as possible, regardless of whether or not that care, despite the fact that they’re sleeping, cursing or no longer in the room. It’s his personal mission in life to convince all non soccer-lovers that they are mistaken. Me: Dave, come here for a sec. Me: Is it ok to talk soccer to people who aren’t interested? Dave: I think it’s fine to talk to non-fans as much as I want, because if they don’t know what’s going on- they should. How else are they going to learn? Me: Ok fine, but when should you stop talking? Dave: I guess when they roll their eyes and zone out I know they’re not interested. But you’re a special case. It’s going to take years to wear you down, but you’ll like it eventually. It’s already working! 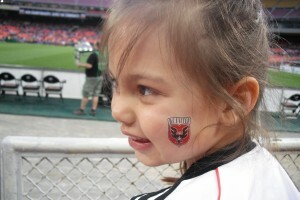 Remember how much fun you had at the last DC United game? Me: No, I don’t remember. Dave: Remember when I took you to see Beckham? That was pretty cool, wasn’t it? Me: I guess. Can you go away and stop talking to me about soccer now? Dave: You’re the one who called me over here! According to the BBC article, there’s an assumption (in Britain) that people who don’t care about “football” are a bunch of unpatriotic “ninnies.” Obviously soccer is a much bigger deal overseas than in the U.S. but, even in England, a new poll shows that less than half the population is interested in the sport. 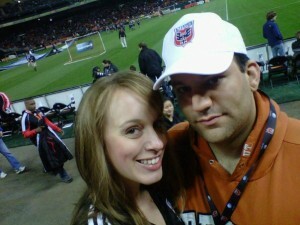 But never fear, soccer lovers— Dave is, single-handedly making up for that on this side of the pond. He strategically found our current home just 5 blocks from DC United’s stadium, he’s been a front-row season ticket holder for years, doesn’t miss a game, subscribes to Fox Soccer channel so he can record and re-watch games, writes letters to the MLS commissioner about mistakes he thinks are being made in the league, has bought every one in our family (not just the immediate one) a soccer jersey, and… well, you get the picture. Sometimes I feel like Drew Barrymore in movie, Fever Pitch… which I just found out was actually a remake of a British film about how a fan’s obsession with Arsenal got in the way of his relationship. I have tried for years to curb the soccer talk at our house. I mean, what is there to discuss when you’ve just had a 90 minute conversation with the television? But he is persistent… even learning random tidbits about players’ wives, hoping to peak my interest in any way possible. “Dave, I’m not listening. Dave, I stopped caring 5 minutes ago. Dave, that’s enough!” Nothing works. The BBC article quotes an etiquette expert who says it’s rude to discuss “football” with people who don’t want to hear about it… but then it quotes football fans who don’t care whether it’s rude or not. They say they can’t help themselves, and the rest of us should just get on board. So what’s a girl like me to do? Whether it’s American football, baseball, or golf (yuck), a man’s love affair with his sport-of-choice is here to stay. In the meantime, I’m trying to come up with a topic that’s as uninteresting to him as soccer is to me… so that I can torture him with it, of course. Any ideas?